Windows 8, CyanogenMOD 9 and a Google Adsense payout! It's been an interesting month! 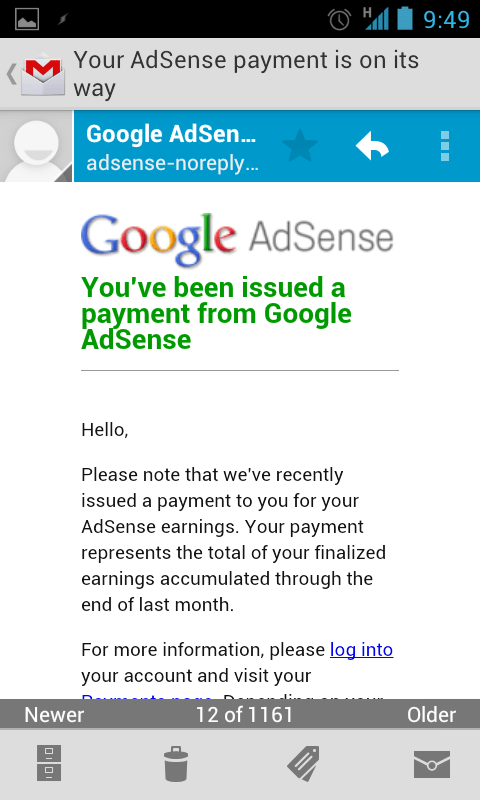 I have finally received a payment from Google's Adsense! It has been set up for about 3 years and last week I finally reached the minimum requirement for payment. I'd almost forgotten that the account even existed. If only Quidco woke up and worked for me now! 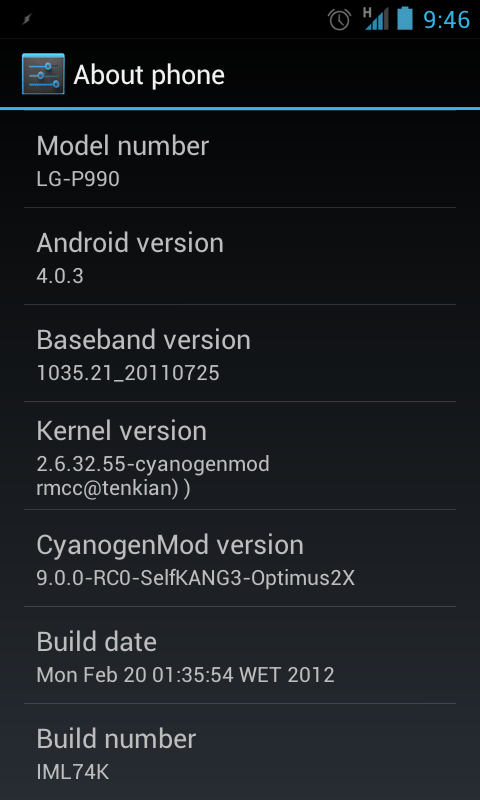 CM9 for the LG Optimus 2X has also been released in a 'very beta' form thanks to Arcee. You can download it from rootzwiki and get Google apps from goo-inside. (Using the SK3 build) It seems pretty good at this stage, I found the menus very fast and smooth. There are several known problems particularly with the video camera, I couldn't personally get mobile data to work consistently but others have had it going after flashing the 20L baseband (coming from 20A) my data problem was fixed. The menus remained stutter fee even after installing all my apps! One annoyance is the lack of USB mass storage, I can only choose to connect as a camera or a media thingy, neither of which work as quickly or have the controls (from windows end) of regular mass storage. 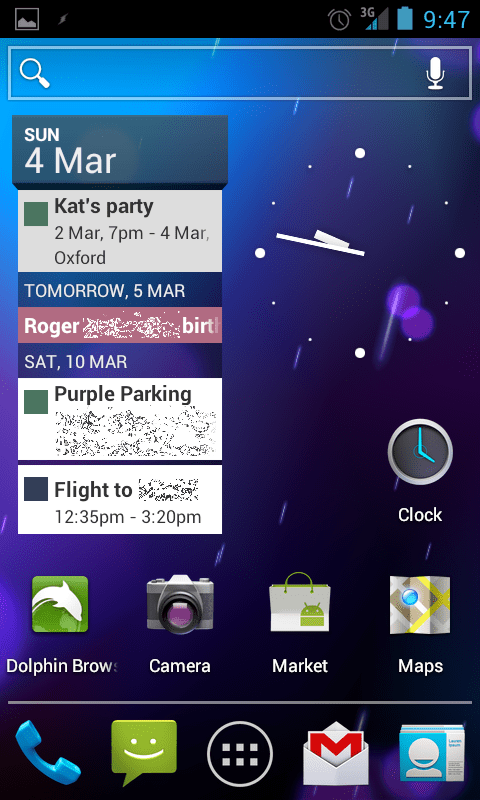 I have since gone back to CM7 because I can rely on it for work etc but I am very excited for future developments. I spent several hours messing about on Thursday night /Friday morning trying to get Windows 8 installed, I was going to try to 'upgrade' from 7 but that failed twice, eventually on Friday morning I dug out an old HD, plugged it in and installed a fresh copy on there! Anyway, when I got home from work and finally had a play with it... well... I had no idea how to do anything! I felt I was missing buttons for back, menu, home and search! It was as if someone had hooked up a smartphone to my computer monitor and forgotten to give me the phone to control it with. I clicked my first tile, the app store, it opened and I had a MASSIVE white screen with some pictures in the middle. It felt similar to other market apps on my phone. My initial impression was that the app wasn't really making use of my large screen. I normally have many windows open at once, none of which maximised allowing me to rapidly switch between tasks and have multiple windows side by side. It looked clean though, my first problem as such was that I had no idea how to leave this program! There was no cross, no back button, the edges didn't seem to do anything! I was stuck in a crazy sized app store! Turns out when I eventually put my mouse in the few pixels at the extreme bottom left of my screen a little box popped up that resembled the start screen, finally a way out! 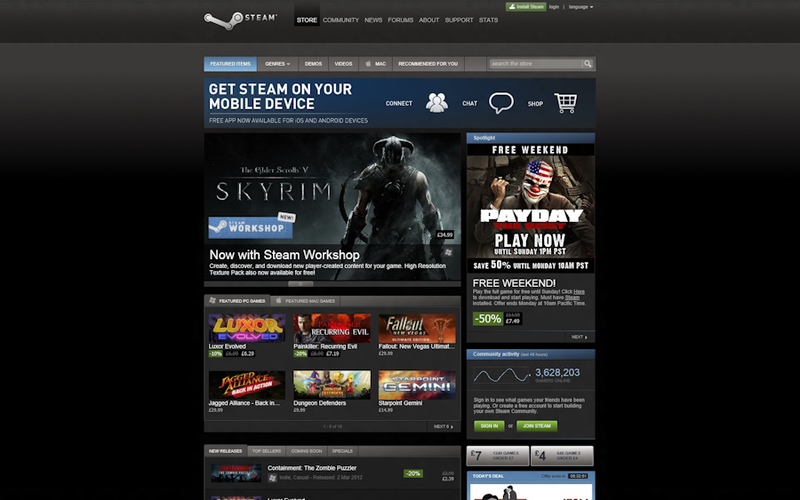 The feeling of wasted space wasn't just with the app store, with a full-screen toolbar-less browser ie the default Internet Explorer tile, many websites are 50% background with a relatively narrow page in a column down the centre of the screen. After a bit more fiddling I found that many of the menus are activated by first moving your mouse to the very corners of the screen or right clicking within the screen. This allowed access to additional options and features. I have now had much more time using the new OS. I feel I am now starting to understand how the guys at Microsoft wanted me to use the tiles. I think the benefit (run with me) will be seen when many more apps utilise this new metro interface and when they integrate more strongly. I clicked on someone's address within the People app and it opened Bing maps in the IE tile, that's fine but wouldn't it have been better to open in the maps tile? 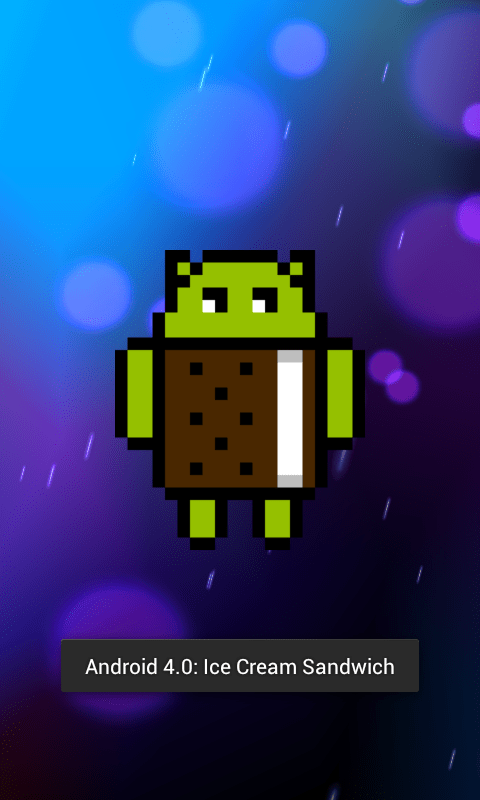 Subtle but that is the difference that will make it feel as integrated as an iOS or Android operating system. As an added extra, I installed the latest NVIDIA drivers and copied Skyrim over from my regular HD and it worked perfectly set at ultra (so at least as well as Windows 7). 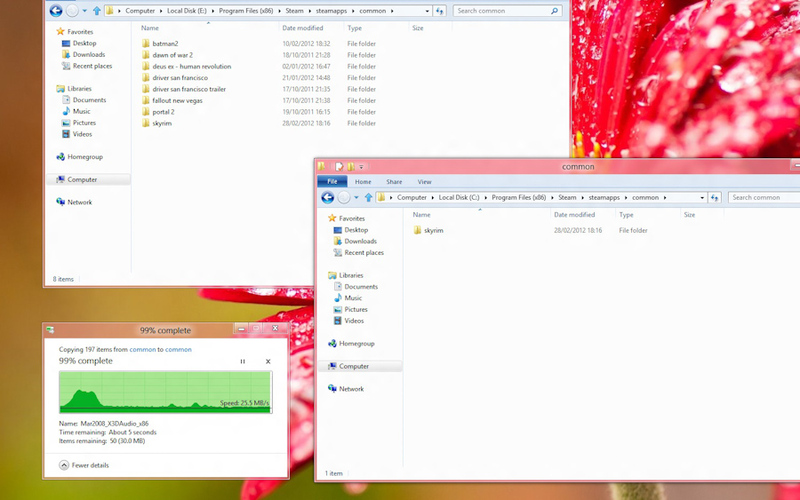 I don't think anyone doubted Windows 8's performance but figured I'd test it for good measure! To summarise the metro experience, it is like the world's most powerful phone ever with a 24" non-touch screen and no working app store... yet. Lots of potential. I'm going to continue using Windows 8 on and off and will probably update again at some point in the future. 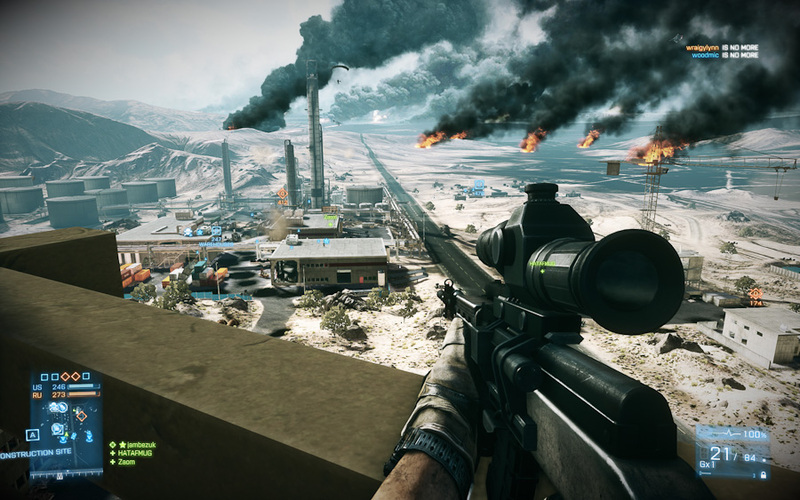 So I got BF3 on the day it came out, installed asap, was amazed. The graphics, particularly in the campaign, are stunning. I decided I was going to play the campaign first to get a feeling for controls etc before taking on multi-player. I got about half way through the campaign before I tried it. It feels very similar to BF2 in game style so I was quick to get into it. I didn't play any of the Battlefield games in between so cannot comment on the evolution of the series. I have to admit I'm not great. I will hold my hands up and admit at one point I googled around for advice on how to not to die so quickly... not that it particularly helped. One thing I could relate to was the large number of forum posts with people complaining about the fact they could empty entire clips into enemies who would fire only two shots back and kill them! Turns out the answer is simple you need to shoot first and you need to shoot accurately. Obvious, yet this was my major problem. I had noticed when using a sniper rifle that despite getting an upgrade to allow reloading while aiming, I stopped aiming anyway. It made me pay more attention to what I was doing. I noticed I would often see the enemy first, I put that down to having fast computer, low ping and being observant. Problem was I would naturally then 'aim' (with scope) before shooting, accurate yes but not fast. By the time I had decided they were the enemy and started aiming they would have noticed me. I then tried to avoid 'aimed' fire (ie shooting from the hip) and found that by starting the shooting that fraction of a second earlier makes a MASSIVE difference. Seems that getting the first hit to the chest is more effective on average then trying to get the first hit to the head. Obviously sometimes you get lucky and a bullet hits their head anyway making the whole process a lot quicker! Anyway, once I had this realisation I became much more effective when running around. At a similar time to this enlightenment I unlocked a 12x scope and bipod for my sniper rifle which dramatically increased my effectiveness at long range encounters. The bipod allows the scope to be held perfectly still making lining up precise shots relatively easy. For the very long distance shots, the challenge becomes combining the delay for the bullet to travel and the bullet drop. 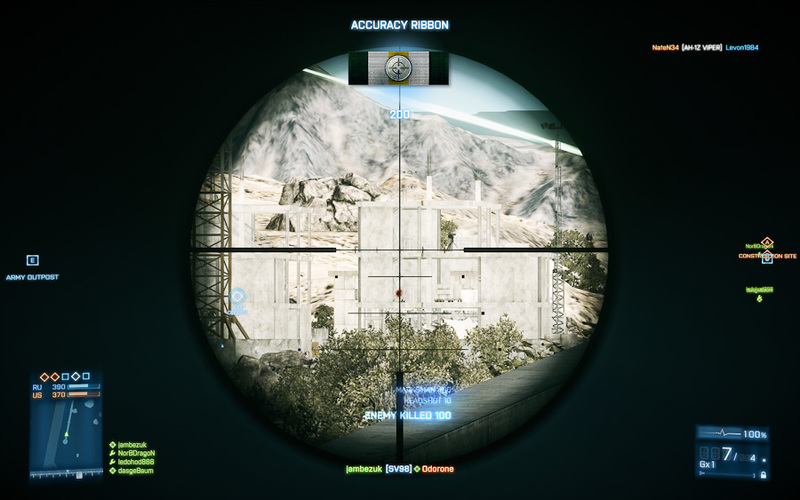 The difference in height between the centre of the scope and the blood splatter shows the significant bullet drop over long range. My longest headshot to date is 551m, while I enjoy trying to make this as large as possible I don't think it will increase much beyond this as the opportunity to make shots this long is so infrequent. A lot of things have changed since my last post... One big change is that I finally upgraded my computer. I have been using a Dell M1710 XPS laptop for over 5 years, has been great but lacks the credentials required for many modern games. Sporting a 512MB Nvidia Geforce Go 7950 GTX , it didn't tick the box for DirectX 10, aka 8000 series or newer graphics cards. It could run crysis on low/medium settings at about 1280x800, still looked good, on a faster system it just looked even better! Anyway, now I have plenty of juice 😎 earlier today I finished my first run through the new Deus Ex game, all graphics set to max and 1920x1200 resolution with faultless frame rates. I loved the first two Deus Ex games so seemed fitting to break the PC in with the latest one. This was the first computer I have ever built from scratch and I'm very pleased with the result. I bought all the parts from Overclockers UK who provided helpful pre-purchase advice. Turned out within the first 48 hours, one of my RAM sticks was faulty. I was planning a long drive the next day so gave them a call and was able to take a detour via their shop and swap the RAM there and then. Absolutely perfect, no down time for my computer and the extra petrol cost less that the postage back. 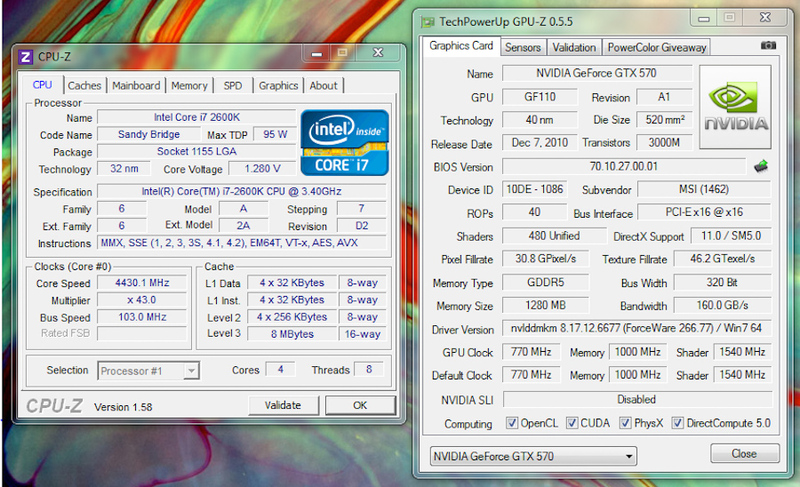 Using ASUS TurboV EVO automatic overclocking my CPU now runs up to 4.4Ghz, up from 3.4Ghz! 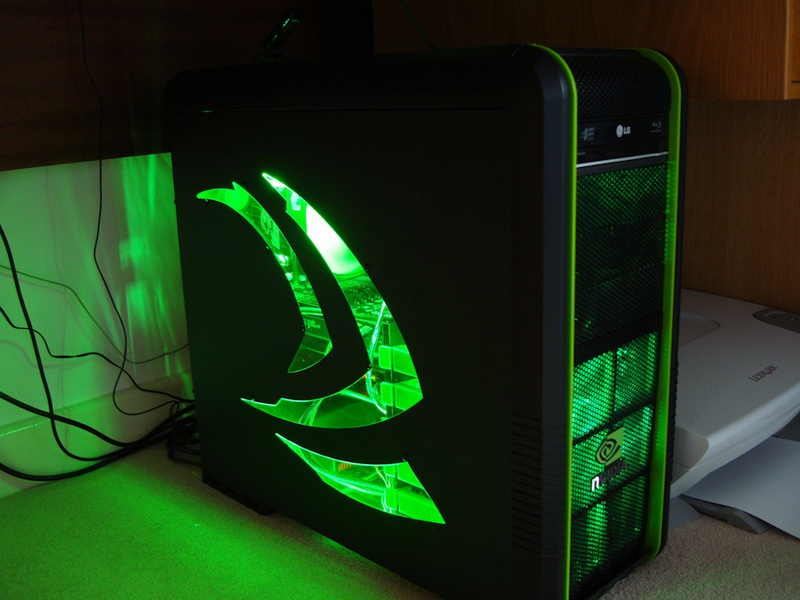 I have also added three 30cm green cold cathrode lights to the inside of my case. This was mainly because I thought my lovely green window looked dull under a desk... now it lights my feet up! Whoop! Following my first attempt at the name game, I released that my hint code was rubbish (but really, I knew that at the time) and that it's very difficult to guess a random name with so few clues. First of all, the code has been improved. It will tell you how many letters you have correct from the first letter, ie first 3 letters or first 100 letters. Secondly, as additional help it can tell you every letter that is correct. This major addition should make guessing from scratch much easier. Version 2 of the name game never made it online as I was already working on version 3. Version 3 got updated to v4 since being posted!